If you are looking to start training at home, you need to make sure that it will be just as effective as training at the gym. That is probably one of the reasons people have, for seeking out the top 10 best heavy bag stands in 2019. Be it in martial arts or boxing, the importance of a great heavy bag stand can’t be overlooked. The best heavy bag stand will help raise your skills. The right one will enable you to work on your timing, combinations, conditioning, and technique among other aspects. For people who don’t have the option of drilling their ceiling or wall, heavy bag stands are the way to go. It may be because you are renting the place, or that the structural elements of the walls and ceiling are weak. 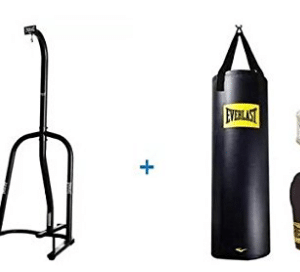 Either way, a heavy bag stand will make it easier for you to incorporate boxing into your workouts. The bag stand’s weight limit: Heavy bags come in different weights. You should make sure that the heavy bag stand you buy can hold the bag, without any difficulty. If you end up purchasing a lighter bag stand than your heavy bag, the stand may end up damaged. Swaying will also become an issue. The material of the heavy bag stand: It’s always important to check the kind of materials the stand is made from. For a well-constructed bag stand, you should ensure that it’s made from steel tubing. These also play a big role in its durability as well. The design: Heavy bag stands are available in different designs. You need to decide if you are looking for a single or multi-station bag stand. You also need to analyze the amount of space that you have. Some stands take up lesser space than others. 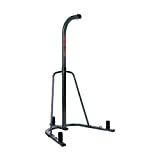 Price: Just like with other products, heavy bag stands also vary in price. Some of them have price ranges that even go up to $1400. Others are also available for as low as $100. First, evaluate your finances before making any decisions. Then go narrow down to the options available in your budget. 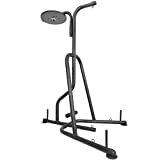 The Titan Dual Station boxing stand will offer you a variety of workouts. The steel tubing used to construct it is very sturdy and its foundation is guaranteed. You will get to maximize on two training methods. 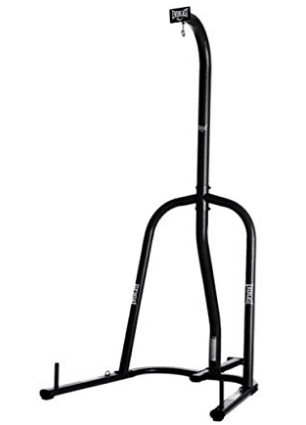 This dual heavy bag stand will enable you to work on aspects of power and speed. This is because its design enables a speed bag to be attached to it as well. 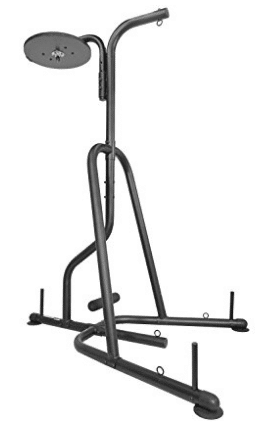 I would recommend this stand, for people who want to work out targeting their upper body and core area. It can only be used with bags that weigh 100lbs and below. The heavy bag stand has 3 weight plate pegs. 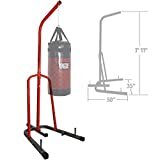 I would definitely recommend this heavy bag stand, to people who are just starting out their training. Your purchase comes with a heavy bag that weighs 70lbs. For beginners, starting your training with a lightweight heavy bag stand is the right way to go. Your purchase will also include a hand wraps, boxing gloves, a bracket mount and chain assembly. To ensure its stability, the bag stand has 3 sturdy weight plate pegs. What makes this stand a great choice, is its easy assembly process. You won’t get frustrated as you set up for the first time. The stand can hold a maximum of 100lbs. The steel tubing used is of high quality. Your all in one solution is here. This heavy bag stand comprises of so many types of equipment. 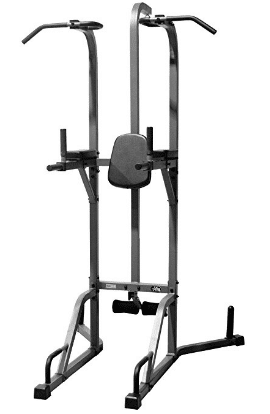 When you buy the XM-2842, you will also be getting a dip station, push-up station, split grip pull-up bar, vertical knee raise, and heavy bag workout station. All for the price of one! You will definitely have the closest thing to a gym! The cushioning is 2.5 inches thick. It is very high density and has been double stitched. To make it more reliable, the Duraguard vinyl used is resistant to tearing. The stand’s feet are made of skid-resistant rubber. It also has a powder coat finish. 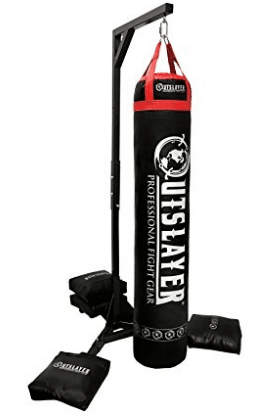 Outslayer offers a heavy duty punch bag stand. It can hold up to a 350lbs heavy bag. 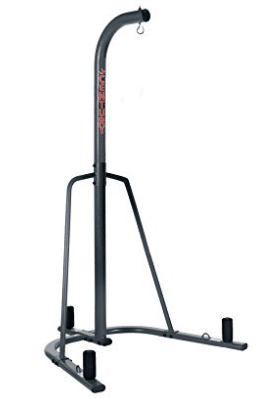 The heavy bag stand is stable and can be weighed down with 34 sandbags. Your purchase will include 4 unfilled sandbags, for that purpose. Assembling this stand is so effortless, you will just need 7 screws. Made in the USA, this stand is best suited for Muay Thai Kick Boxing. The great thing about this purchase is that it lets you use a variety of heavy bags. You can even alternate them as your skill level grows. You won’t need to keep buying heavy bag stands, every now and then. The heavy bag stand is 7.8ft tall. You will get a 15-year warranty. 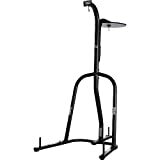 For aerobic fitness workout focused on solid strength building, this is the stand you need. It is your ticket to acquiring a healthy lifestyle. 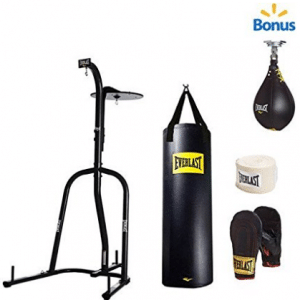 What makes this heavy bag stand popular, is that it is well supported to take on the strongest boxing and MMA strikes knees and kicks. You can’t go wrong with it! While working out, you will be able to access the bag at 180 degrees. The stand works quite well with long bags. The dimension of the long bag should be 9.5-inch tall x 35-inch wide x 52-inch deep. The steel construction is durable. It can be used in different locations. 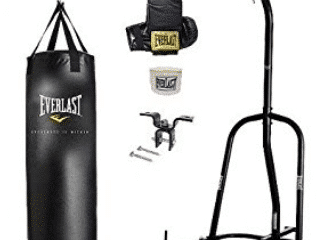 This Everlast heavy bag stand comes in a kit. Your purchase will arrive with all the necessary items to help kick-start your training. You’ll definitely impressed with the quality of the gloves and the tape included. The sandbag that also comes with them weighs 100lbs. If you don’t own the items mentioned, this would be a great purchase to start with. The heavy bag comes filled. Setting the heavy bag stand is easy. 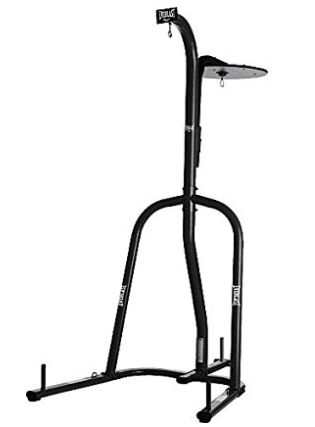 Century has constructed this heavy bag stand, with 3 inches of tubular steel. It is heavy duty and comes in a gray color. This stand is recommended for people who practice martial arts and boxers. It was designed with them specifically in mind. 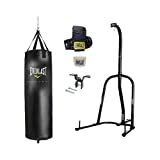 The Century Heavy Bag Stand is a great equipment to help enhance your skills with. It comes at a pocket-friendly price as well. Assembly will be required before you can use the stand. It has a 100lbs weight capacity. Like a few options we have come across, this is definitely a value purchase. To provide you with adequate comfort, the cotton hand wraps that come with it are 100% breathable. They are designed to give excellent support as well. The Nevatear Heavy Bag has re-enforced webbing. It also comes with a heavy bag chain that can be adjusted as desired. 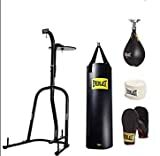 You will be able to use both a speed and heavy bag since the stand is a dual station. For stability, the gloves have a padded palm grip. You will also get a speed bag. One of the best features that a heavy bag stand can have is powder coating. Reason being, it inhibits the steel tubing from being corroded and such. As a result, the stand lasts for a long amount of time. This particular stand measures about 69″ L x 48.25″ W x 84.13″ tall and comes with 3 weight plate pegs. This provides it with maximum strength and does not restrict your usage limits. Products for repair or replacement should be returned in 120 days. 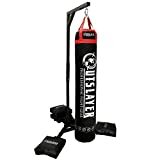 Everlast tops the list with this double stationed heavy bag stand. The construction of this stand is rugged and it is able to support about 100lbs. What made me take note of it was its speed bag platform. 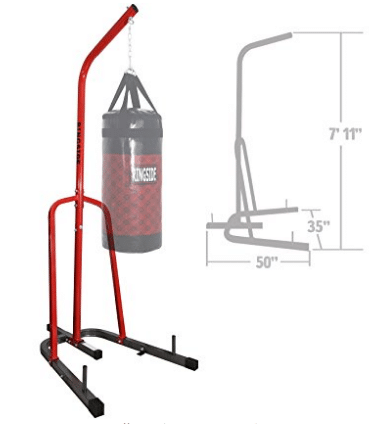 The height can be adjusted and any speed bag size can be used on it. Not many heavy bag stands have that capability. It comes with 3 weight pegs. 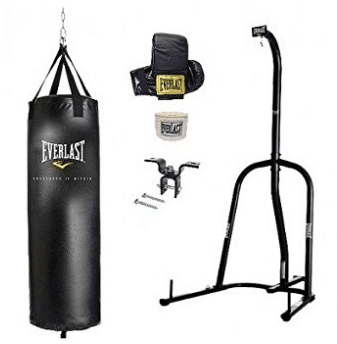 In this top 10 best heavy bag stand review, the Everlast – 2 Station Heavy Bag Stand is our preferred pick. Everlast is an industry leader and this stand is proof of that. You get to have more than one training method and a stand that will outlast many others. Your upper body and core training will never be the same again!